Kaushik Biswas is an Associate Professor at the Division of Molecular Medicine, Bose Institute, Kolkata. 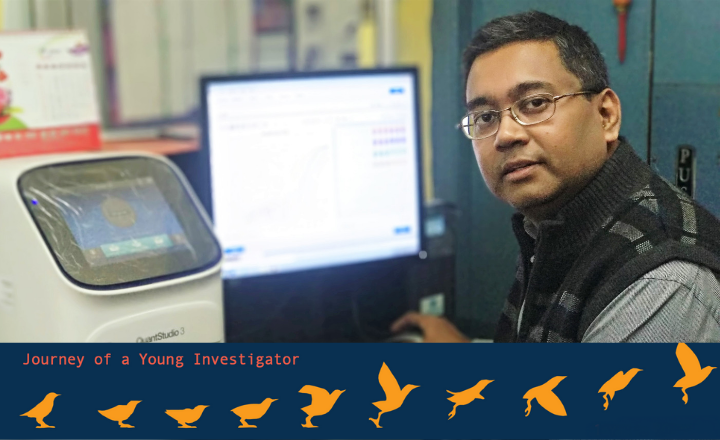 In this article he discusses the self-doubt that is faced by every young PI returning to India to set up their lab, and the various strategies that can make the initial transition smoother. I still remember the excitement that gradually grew from the time I first learnt about my new job back in Kolkata, India, till about a month before my departure from the US. I was returning to my home country after almost 8 years of postdoc. During those eight years, my only aim was to publish quality science and that too fast (which is easier said than done) and return to India. Surprisingly, my “exponential” curve of excitement gradually died down with an almost parallel growth of anxiety and emotions in anticipation of facing the reality of being an independent PI in India. Amongst these, self-doubt was the most predominant. It is in human nature to desire success in whatever we venture towards, and uncertainty in whether or not we may succeed creates that element of doubt within ourselves. I was no exception. The other aspect was that having completed my PhD in India, I knew that the “research terrain” in India is more “rugged” in terms of infrastructure, resource as well as funds, all three of which are somehow directly or indirectly related to each other. This knowledge only helped compound my self-doubt. It was only after the next 8 years in India that I fully realized that my worries were not baseless. Here, I will try to share some of the experiences I had as an independent researcher from the time of setting up my lab till establishing (in the form of a peer-reviewed publication) a research problem of my own. Running a research lab in India made me realize the true worth of the age-old phrase “No Cross, No Crown”, and in spite of all the hardships and struggles we undergo as a young PI, the joy and satisfaction that accompanies the success of solving a scientific question is reason enough to return to India and head our own labs. There is no “magic recipe” for success, more so for a fresh YI who has just returned, but the following points may help make the transition smoother. Overcoming the element of self-doubt: I would not worry much about this, and let it remain within myself. To me, self-doubt is necessary as it formulates a mechanism of “chronic” self-assessment. Without self-assessment we would be blind. So let the self-doubt remain within its own limits as long as it helps you perform better. Setting up the lab : This is one of the most difficult phases in the career of a YI, and it needs minimal scientific ability and more management skills. Management includes handling the very limited resources of most Government Institutions, dealing with the lack of adequate infrastructure (in most places in India, a lab space is often not pre-designated and allotted, and the lengthy process of lab space handover happens only post-joining), getting the most out of the very limited funds you have been supplied with, and last but not the least, utlizing the restricted manpower (in the form of a few newly recruited JRFs) in setting up the lab and at the same time generating the very critical preliminary data for a possible grant, which may be one’s lifeline for the next 3 years. My take for this whole scenario is to take one day at a time, and avoid looking too far down the road. Getting The First Grant : Quality science and research grants are the two “Lifelines” of a lab, and the two are interdependent. It is always advisable to find a basic scientific question (however challenging it might be), answering which might lead to significant insights into the vital processes of life, and which might be applied for societal benefit as well. This will expedite the chances of getting the first grant, without which a very good problem might fall short of being resolved. Another factor that might affect the funding of a proposal in the early stages is the researcher’s age. Starting early, preferably below 35 years of age, has its own advantages. Several extramural funding agencies have tailor-made opportunities for funding, specifically for YIs below the age of 35. So if you are an aspiring YI eager to return, return early. Choosing the Scientific Problem : Choosing the correct scientific problem is key to one’s success. More often than not, we are tempted to continue our independent career with the same problem where we left off at postdoc, either because of closer acquaintance with the subject, or because it is the easiest route. This might work for a few, but for many, this approach lacks originality and one may also end up competing with their own postdoc lab. Try to think of something new, perhaps related to what you might have pursued before, but not a continuation. Explore some new aspects which have not been studied before or may have been neglected. Try finding a question which has a direct bearing on human health, as that scores hugely in terms of direct benefit to mankind. We must never forget that we use Government money to explore our independent ideas, and we owe it to the nation to return back with something that might directly/indirectly contribute towards societal improvement. I believe that whatever we choose to do, we should study in-depth and not superficially, and complete a story. A story is something which everyone likes, remembers and hence presents an opportunity for us scientists to reach others easily, eventually providing a gateway to improve understanding of the subject. Too much diversification may lead to De-focusing : As a YI, it is extremely important to identify one’s research area and draw a clear line in as far as diversification is concerned. Diversification in research is often necessary and important, but within a certain limit. Too much diversification may lead to unnecessary dilution of one’s original research problem. Keeping focus on the primary research area and carrying out in-depth studies ultimately also helps in getting noticed and recognized for contributions to a particular subject area, both nationally as well as internationally. Opening the doors and windows of one’s mind to new ideas : As a YI, I have been open to new ideas from all avenues, be it my senior colleagues, younger colleagues and particularly students and post-docs. It often helped me open my eyes towards directions I may have never fathomed, and that have opened up a totally novel area of research in my lab. More often than not, fresh ideas emerge from students who are completely invested in their research, and this investment in terms of time, effort and passion provides returns in terms of new emerging ideas. The other aspect of being open is to accept criticism in the most positive way – even if you feel that a critic is particularly harsh on your newly presented data, taking the positives from these interactions will ultimately benefit the YI. The quality of accepting criticism in a positive way should be embraced by every YI, as this would not only help in improving the quality of the work, but will also provide the necessary trigger to invoke challenge within the YI to further his/her research. All this said, the success of a YI will ultimately depend on his/her motivation, determination, perseverance and willingness to dive deep into whatever he/she is pursuing. Quality science stems from in-depth and detailed studies, and quality science will be the ultimate basis for a scientist’s success – whether they be young or old.